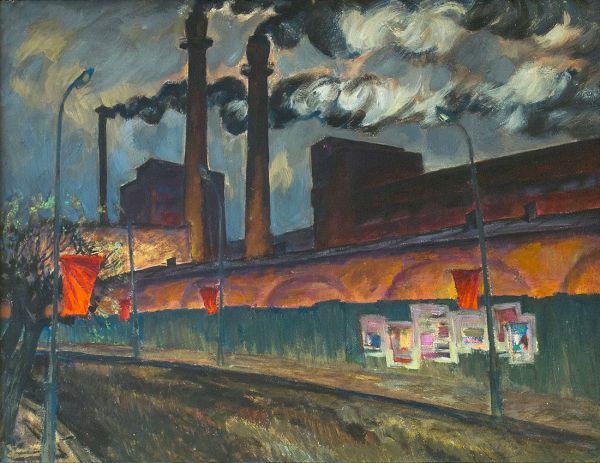 Buy works – Gridnev Nikolay Sergeyevich | (1928-1980). Soviet painter is a monumentalist. Member of the USSR Union of Artists. Apprentice А.М. Lyubimova. He was born in 1928. Graduate of the Department of Monumental and Decorative Paintings in 1952 (third edition). Thesis work - a sketch of a panel for the City Executive Committee (Leningrad). Theme - "Proclamation of VI. Lenin to the Soviet Government. " Teachers - A.M. Lyubimov, architect K.L. Johansen. He taught at the Leningrad Art Museum. IN AND. Mukhina in 1952-1954 years. Participated in exhibitions since 1954. In 1954-1963 he worked in Novosibirsk. The author's works are in many regional museums and in private collections.